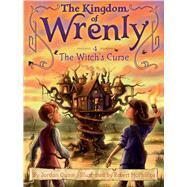 It’s up to Lucas and Clara to reverse a curse on the kingdom in this fourth chapter book in the fantastical Kingdom of Wrenly series. Someone has cursed the Kingdom of Wrenly, making it rain nonstop for six whole days! The fields are in danger of flooding, which will ruin all the crops. Can Lucas and Clara figure out who’s behind the evil spell and stop the villain before it’s too late?